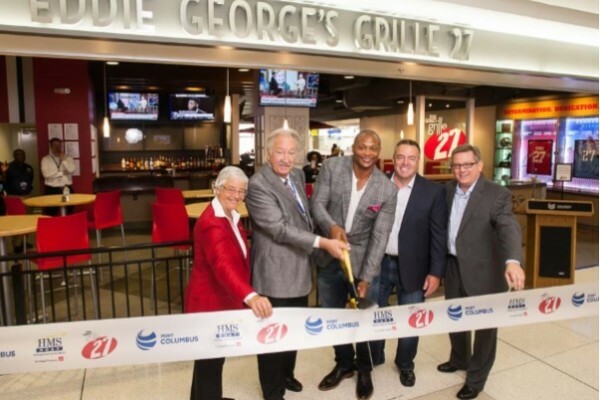 COLUMBUS, OH, 2015-8-20 — /Travel PR News/ — Global restaurateur HMSHost has scored the winning touchdown with Columbus passengers with the opening of Eddie George’s Grille 27, the newest dining addition at Port Columbus International Airport. HMSHost, in partnership with the Columbus Regional Airport Authority and renowned Ohio State football legend turned restaurateur Eddie George, officially introduced the restaurant with a grand opening today; combining an inviting sports theme and diverse menu that excites travelers’ culinary expectations while showcasing the spirit of Columbus. Eddie George, a nine-season NFL star running back for the Tennessee Titans and 1995 Heisman Trophy winner at The Ohio State University, has ventured beyond his athlete persona finding wild success as a restaurateur. George opened his first restaurant in Nashville followed by a second located in the heart of The Ohio State University campus. The Eddie George’s Grille 27 experience that so many have raved about is now available for travelers in the heart of Concourse B in Port Columbus International Airport. Located next to the airport’s recently modernized gates B19 and B21, the restaurant offers full table service, a full bar, a graband-go counter, and a panoramic view of the new south runway. The state of the art high-definition televisions make you feel like you’re on the sidelines at Ohio Stadium. Travelers find a relaxing respite from the hustle and bustle of an airport while at Eddie George’s Grille 27 where they can also catch a taste of the Ohio State football experience. It fits right in with Port Columbus and HMSHost’s dining vision to bring more local flavors into the airport and allow travelers from across the country to savor good food and enjoy a common love of sports. Aside from the best sports viewing you could imagine in between flights, Eddie’s versatile menu offers a lot more than the archetypal everyday bar food, providing a dynamic selection ranging from mouthwatering breakfast options to gourmet appetizers to upscale spins on sports bar favorites to hand-crafted entrees. If you prefer a lighter meal you can choose from a variety of fresh salads such as the Balsamic Roasted Beet Salad with fire roasted beets, goat cheese, and toasted almonds tossed in a balsamic vinaigrette. For something filling and satisfying, you can opt for the Grilled BBQ Burrito stuffed with grilled chicken. Eddie has even got you covered if you want to go for something more fresh and sophisticated. The Cedar Planked Salmon cooked on a cedar plank over an open flame and served with a mustard dill sauce, brown rice, and fresh broccoli will give you that upscale culinary experience. Eddie George has nailed down the ultimate sports bar experience with this airport venue. From kickoff to takeoff; from breakfast to dinnertime, he took this one all the way for a touchdown, and it’s how Port Columbus and HMSHost go the distance daily to serve their airport customers. Cutting the ribbon, from left to right: Elaine Roberts, President & CEO, Columbus Regional Airport Authority; William R. Heifner, Vice-Chair, Columbus Regional Airport Authority Board of Directors; Eddie George, Heisman Trophy winner, entrepreneur, restaurateur; Bob Burness, CEO, G.R.E.A.T. Grille Group; Kent Vanden Oever, VP, Business Development, HMSHost. This entry was posted in Airports, Food & Drinks, Travel Services, Travelers and tagged Eddie George, Elaine Roberts, Grille 27, HMSHost, Kent Vanden, Port Columbus International Airport. Bookmark the permalink.